Enter our Goodreads giveaway for a chance to win one of five paperback copies of The Joy of Argument. In a world where opinions are more often shouted than discussed, The Joy of Argument teaches you how to become a skilled participant in the art of intelligent discourse. Learn how to craft a better argument to get more of what you want and less of what you don’t–learn the joy of argument. Enter to win your copy here. This compact guide to argument was written by an expert but designed for the layman. Featuring easily digestible, concise sections, The Joy of Argument covers such topics as: Lack of Proof, What do the Numbers Prove?, Nerves, and Hot Words. This giveaway will close on April 8, 2017 and is free to enter. The regular price of the book is $14.95. Convinced? Click here to enter the giveaway. 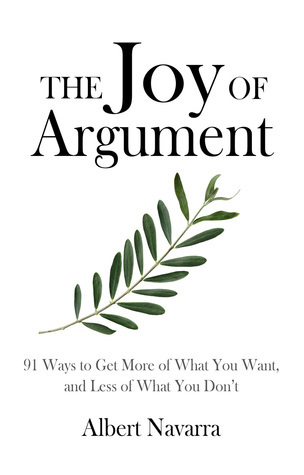 The Joy of Argument is a compact guide to getting what you want through intelligent discourse. In the age of social media, we’re constantly being bombarded with the opinions of others. Albert Navarra’s book offers expert advice to help you craft arguments to get your point across, while disarming and dissuading even the loudest opponent. Good luck in the giveaway, and happy reading! Giveaway ends May 30, 2016.